I have to point to one of Eduardo Amorim's photos again. He takes beautiful photos of gaucho culture. This is a traditional gaucho boot - straight out of the Middle Ages in design! 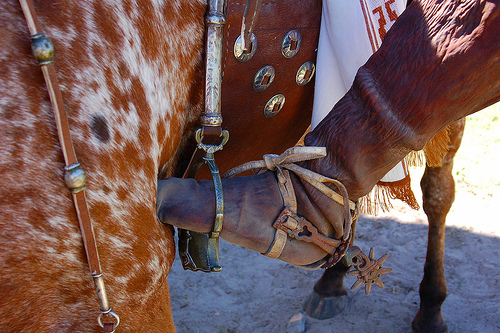 It is made from the entire skin of the leg of a horse, cow, or other animal, cured and fitted to the rider's leg without being cut or stitched except to close the toe end. The annotation mentions that in rare cases the boots are even made from the leg skin of a puma or jaguar!